Plant epiphyte or litophyte with many fleshy roots. Leaves fleshy, elliptic or obovate-elliptic, with acute or obtuse apex, cuneate at base, long 20 cm or more, broad from 6 to 8 cm. Normally 4/5 leaves, even up to 9 on well developed plants. Flower stalk leaving very low on the stem, between the desiccated bases of the old leaves, more long than the foliage, arcuate or pendent, simple or branchy, bearing many flowers opening successively on a long period, persisting several years. Bracts short, triangular, acuminate, cucullate, from 5 to 7 mm long. Flower fleshy from 5 to 6 cm, star-shaped, with very variable color, delicately scented. Sepals oblong-elliptic or obovate-elliptic, acute or obtuse. Petals identical to the sepals but slightly shorter. More or less concave sepals and petals. Lip 1/3 shorter than the petals, 3-lobed, at cuneate base, briefly pedicellate. Lateral lobes triangular, sickle-shaped, provided of a turned over hook, more or less notched apex, with a flattened callus in middle. Midlobe oblong, fleshy, convex, with a high notched central keel, finished by a flattened callus, densely covered of short hairs. Disc between lateral lobes provided with a simple bifide callus, short, sometimes with additional protuberances. At the junction of lateral lobes and midlobe there is a second callus also bifide but more lengthened. Column fleshy, erect, of 8 mm at very developed clinandre, surrounded of a cap slightly denticulate. Pedicellate ovary from 2 to 3 cm long. The problem which remains with Phalaenopsis tetraspis, it's that if we observe the lateral lobes, the hook drawn by Sweet does not appear clearly. But the midlobe is much more lengthened like in the drawing. There is some years, this variety was known only in the herbaria and from illustrations published at the end of last century when this species was in culture in England. Flower white or whitish with some green suffusions. Sepals and petals more or less barred of brown, sometimes uniformly white. White column. Base of midlobe partially veined of purple. More or less scented flowers. In nature this plant grow in very shaded situations. 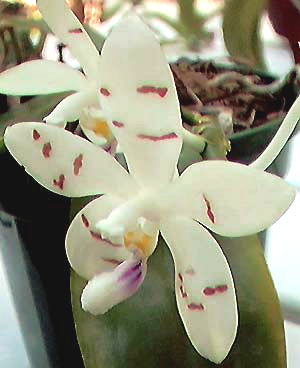 According to Reichenbach, the differences between Phalaenopsis tetraspis and speciosa are multiple. Apart from the time of flowering, the leaves of Phalaenopsis are of a very dark green, and of a remarkable thickness. 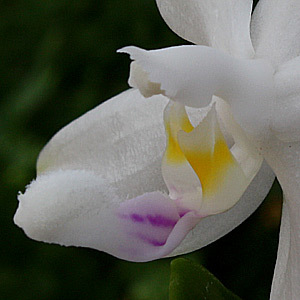 Those of Phalaenopsis speciosa are clearer, almost yellowish, and have less substance. The roots are fewer and less flat. 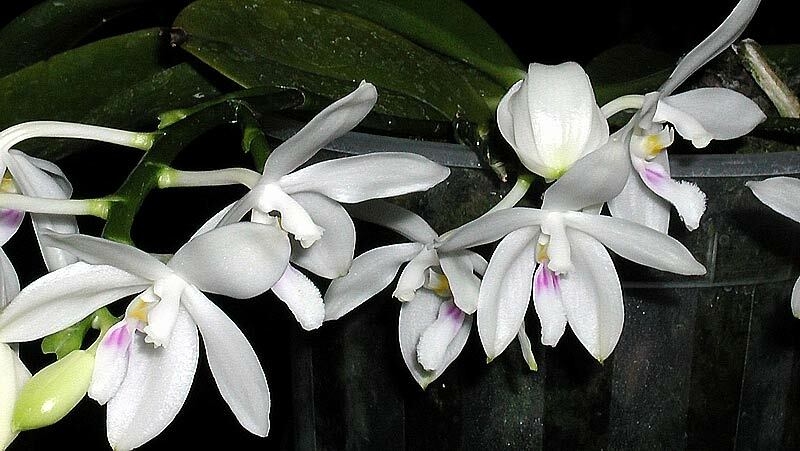 Phalaenopsis speciosa, always from Reichenbach is most floriferous. Collected for the first time by Thomas Lobb who worked for Veitch. The description of Reichenbach was made with plants of this origin. Berkeley also sent in Europe plants collected in the Andaman islands. He wrote in 1893 in Orchid Review that the largest plants did not support the travel and that only smallest arrived alive to England. It describes an exceptional plant with leaves of almost 90 cm length. This plant had produced keikis which themselves had produced others ones, with the result that at the flowering time , the mother-plant, the "daughter-plants" and the "grand-daughter plants" produced jointly a profusion of flowers. It estimates at one hundred the jointly flowering number of stems. This plant pushed on the mangrove, above a nonbrackish water, constantly under very high conditions of moisture. Other subjects grew on the rocks, always rather far away from the sea, this species not seeming to support the spray like some others. Other travellers also make descriptions of this plant growing in the mangroves. 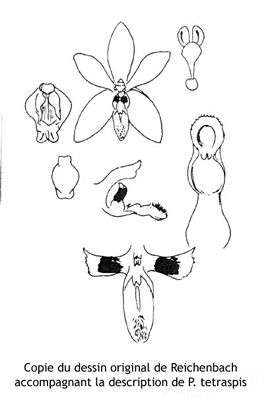 Maurice Vacherot quotes it in his work "Orchidees" of 1957 like close to Phalaenopsis sumatrana, but with flowers white of immaculate ivory and with a midlobe carrying a dense tuft of hairs.